Mobile robots in explorer missions need to charge their batteries from time to time. Different policies for coordinated recharging in teams of robots are evaluated. 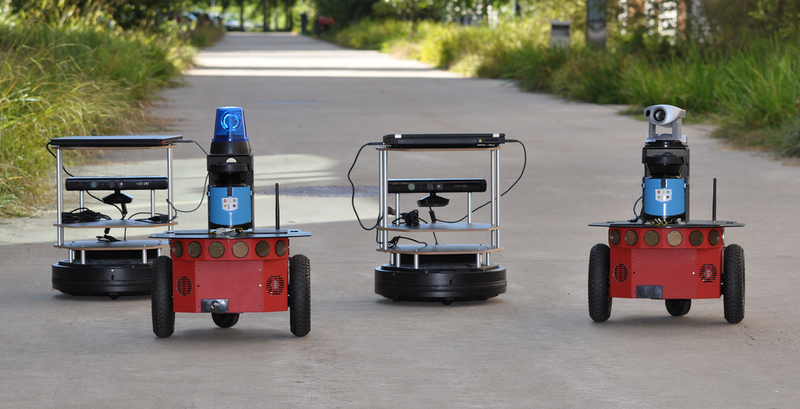 Mobile robots equipped with cameras and other sensors are used in the exploration of unknown environments for disaster management, space missions, and other applications. Sometimes teams of robots are used to explore areas faster. These multiple robots must coordinate each other: they need to determine as to who explores which subarea for how long and manage the recharging of their batteries at docking stations. It is impossible to precompute an optimized schedule in this setting due to the limited time horizon in the exploration of unknown environments. For this reason, Rappaport employs an energy-aware planner to adaptively decide the time and location to recharge a certain robot. The coordination between robots is based on market economy, giving robots the flexibility to incorporate multiple objectives into a single cost function. Different policies are evaluated through simulations with different robot team sizes on different maps. Results demonstrate the applicability for multi-robot exploration and show the strengths and weaknesses of each policy. Ideally, robots recharge not only at fixed docking stations, but some mobile robots act as energy transporters and form supply chains for explorer robots. Coordinated Recharging of Mobile Robots during Exploration. IEEE/RSJ Intern. Conf. on Intelligent Robots and Systems (IROS), 2017.